The Cap Camarat 6.5 WA is a 2018 speedboat with capacity for 7 people (6+ skipper). This boat of almost 7 meters is one of the most comfortable of its kind, with spectacular finishes and an incredible spacious and ergonomic layout. 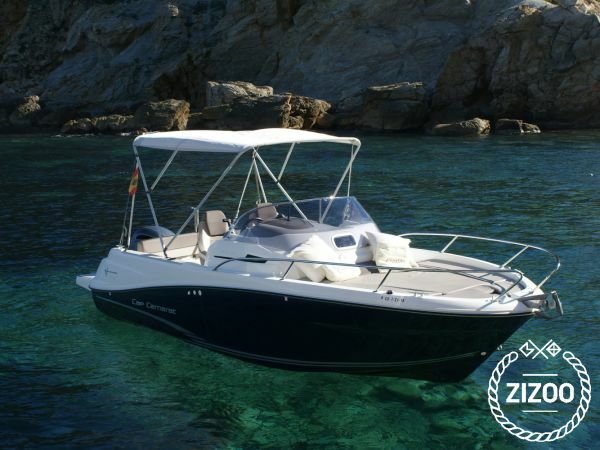 It is the ideal boat to enjoy the waters of Ibiza and Formentera with family or friends. Enjoy the sun of the Mediterranean in its large bow sundeck, particularly secure thanks to its elevated railing. To the aft, two teak swimming platforms will allow you to access the water with total comfort. Children and adults will have a great time! If you have had enough of sun for the moment or if you feel like resting, the beautiful and large cabin of the Cap Camarat 6.5 WA has a double berth and a chemical WC. In addition, in the cockpit, the large bimini top, the seats and the removable table offer you a perfect space to enjoy a picnic surrounded by the blue waters of Ibiza and Formentera. Its Yamaha 150 hp engine has a low consumption and will allow you to easily reach some of the most spectacular spots in Ibiza and Formentera that are only accessible by sea. If you want to have fun in the water, the Cap Camarat 6.5 WA offers you the possibility to practice water sports safely, such as wake, ski or donut. In addition, now you have the possibility to enhance the experience on board by doing one of our sailing routes, specially recommended to optimize your day, or hiring some of our special packages (comfort, birthday, stag/hen party, etc.). All this and much more so that you enjoy the sea with all the comforts. The Cap Camarat 6.5 WA is the ideal boat to discover the islands of Ibiza and Formentera in an affordable way. Don't miss this opportunity! We are in Marina Santa Eulalia, less than 1 hour from Formentera! - The boat can be rented with or without skipper. - If you rent the boat without skipper, it is necessary to show a nautical license upon check-in and leave a refundable deposit of € 1,500. - If you rent the boat with skipper, it is NOT necessary to leave the € 1,500 deposit and we offer you the option to make a closed budged, including boat, skipper and gasoline.